Over the last couple of years we’ve been exploring the granduer of seeing U2 live in concert and I recently came across some excellent info that I wanted to pass along. As you can see my the image above, the first is a detailed and eye-popping infographic which was created by the concert fans over at apple.copydesk.org and illustrates the award-winning and record-setting 360 tour. The image is packed with details about the show and the band. 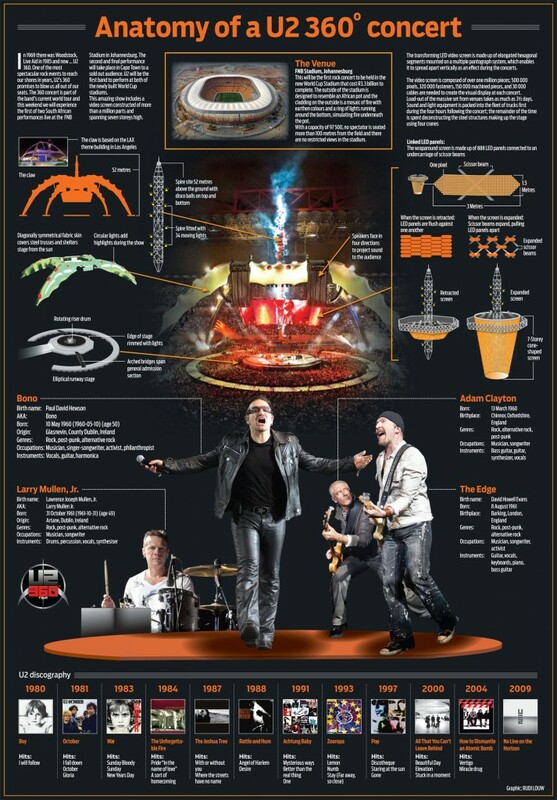 What I love about this infographic is that it does a fantastic job of telling the micro-story behind why fans get so immersed on all levels and what makes a u2 concert so emotionally and visually stimulating, and ultimately unforgettable. If you were at the shows, we’d love to hear what you think of the infographic and what you would add to it. The second nugget we have to share with you is more fodder for our ongoing exploration of the Claw stage that was awe-inducing centerpiece to 360 tour. The stage was desinged by Enerpac and below is a section from the company’s website as they explain how the Claw stage was constructed with speed in mind. We’re excited to share more about the claw so stay tuned as we connect with folks from Enerpac and have them as a guest on Live Fix Radio to talk about the stage and the U2 tour. If you have any questions you’d like answered during the show, go ahead and post them in the comments below. One of the construction requirements was that the stage could be built and taken down again in a relatively short time. The challenge for Stageco was therefore how to assemble and dismantle the massive 230 ton construction each time. Logistics naturally also needed to be considered and a solution had to be found for the installation of the technics (light and sound) and the special 60 ton video screen that also had to be raised and lowered each time. Chain hoists and winches are normally used for stages, with the support of relatively light mobile cranes where required. However, the load in this project was so great that a different solution was called for. One of the alternatives considered was the use of extremely heavy mobile cranes with a lifting capacity of at least 400 to 500 tons. However, there was doubt as to whether such cranes would fit inside the stadiums where the concerts were due to take place and whether they could be stabilised sufficiently.